Ask fellow campers about "Bishop Lake Campgrounds at Brighton State Recreation Area" and nearby attractions. Park, roads, trails, and general area is as clean as always. Power was very low and EMS shut off many times during the day. It was hot during the holiday but the park was not full. Beach has a new water park type area that was well attended. Sites were all clean and grass well kept. We camped at Bishop Lake Campgrounds at Brighton State Recreation Area in a Motorhome. Shopping in Howell or Brighton is convenient. Disc Golf course on the property along with a kids and handicap course. Nice park. Very busy 6th to 10th, then many open spaces. On arrival our fire pit contained trash and unburned food packaging. Mentioned it to the Campground Host and he cleaned it within 10 minutes. Helpful, friendly staff! Campers next to us had trouble with raccoons taking their dog food container during the night. We would stay here again. We camped at Bishop Lake Campgrounds at Brighton State Recreation Area in a Travel Trailer. This is electric only which worked fine for us even for nine days. We were surprised at how packed it was over the weekend, since we thought it would be towards the end of the season. It's wonderful to see locals enjoying this gem! We had a spacious level site. Verizon service worked great here. We're nonresidents so we had to pay for an annual park pass plus a separate pass for the tow vehicle. Plus a web reservation fee. Even with all of that it was worth it. We have family nearby and this recreation area is so beautiful - we went for a walk, run or bike ride every day. It's quiet - no heavy road noise, only an occasional train. And yet, just 15 minutes away there's every major store, restaurant, shopping and convenience you could possibly want. We'll definitely stay here again when visiting family. We camped at Bishop Lake Campgrounds at Brighton State Recreation Area in a Motorhome. Nice State Park. The park was nearly full the 4 days we were there. The campsite was good and only complaint was the trash left in the fire pit by the previous campers. We camped at Bishop Lake Campgrounds at Brighton State Recreation Area in a Travel Trailer. We were looking for a campground that would be convenient to visit friends in Ann Arbor. We're self contained and don't use the facilities except for an occasional shower. We stayed on a weeknight in July. This campground was an easy half hour drive from Ann Arbor. It was clean and well maintained and the staff was friendly and helpful. There was a nice selection of campsites - shady, sunny, lake view, grassy, dirt. The sites were relatively large, spread across an open area interspersed with large trees for shade. There's no wifi. There was acceptable cell service for Verizon and ATT. The shower was quite nice and clean. There was a beach which we did not use. We camped at Bishop Lake Campgrounds at Brighton State Recreation Area in a Motorhome. We were in the area for the balloon festival in nearby Howell which turned into a non event due to weather. Nice enough CG. We were in the upper loop where sites are not really defined. No trees or vegetation separating them. Started as a full weekend but weather chased the softies home. Did not feel too very boxed in when it was full. 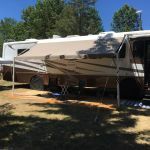 We camped at Bishop Lake Campgrounds at Brighton State Recreation Area in a Fifth Wheel. Nice view of the pond from our site. Birdwatchers will love this one. This camp has a country feel with sunny spots, mature trees, good amenities. Good pull-through site. Canadian geese like the pond and the grass. Cranes graced us on the second morning. We camped at Bishop Lake Campgrounds at Brighton State Recreation Area in a Travel Trailer. The park was crowded due to the July 4th holiday but not noisy at night. Upkeep at the park was good as was the attention by rangers. local police also drove through once a day. Boat and kayak rentals allowed access at reasonable prices while the fishing dock was also available. The beach was not overly crowded as well as the bike trails. Worse problem is low voltage when near the end of the line. Could not run the AC during most of the days there. Was and has always been a problem at this park. We camped at Bishop Lake Campgrounds at Brighton State Recreation Area in a Travel Trailer. Howell and Brighton are within 10 miles and all major stores and restaurants are available. As usual this park is quiet, family friendly, dog friendly, and a good park to face all rigs into the center for a group area. We had 12 rigs, including tents, and had a good family time. The attractions here include the mountain bike trails, Explore guide with activities for the kids, and a quiet lake for swimming and fishing. The campground is close enough to all of the big box shopping so if anything is left home you can get it within 10 miles. We camped at Bishop Lake Campgrounds at Brighton State Recreation Area in a Travel Trailer. We were here before the schools got out for the summer and the campground was mostly empty. We stayed in the upper campground and were pleased. Users were spaced out and the entire campground was quiet. Rangers had everything clean. The fire pits were cleaned out, firewood is available, and canoe/kayak rentals are already available. The beach was raked and ready. We enjoyed all of the trails both around the lake and through the woods. Will be back here. We camped at Bishop Lake Campgrounds at Brighton State Recreation Area in a Travel Trailer. This is a clean park with average size, grass with shade and sun sites but very narrow roads. The park is quiet at night. There is a long paved nature walk to the beach. Great for those who enjoy a walk in nature. We take a wagon to pull our towels, chairs and picnic. The beach is clean, warm and sandy. It's a great park. If the sites were easier to navigate with a larger trailer we would go back to Brighton in a second. We camped at Bishop Lake Campgrounds at Brighton State Recreation Area in a Travel Trailer. We were ahead of the season and there were only 4 other sites occupied. The restrooms were cleaned every day, showers had plenty of hot water, and the park was very clean and free of trash and debris. Were here with 3 other rigs and had a great time. The weather was still a little cool but walking the trails and around the lake was relaxing. We will come back. We camped at Bishop Lake Campgrounds at Brighton State Recreation Area in a Travel Trailer. Sites are large and level. We were there during the week and it was very quiet. For a State Park it was great. We camped at Bishop Lake Campgrounds at Brighton State Recreation Area in a Motorhome. This is a typical Michigan DNR campground. Electric only, 20 & 30 amp, with water spiggots (no threads for hoses) here and there and dump station on the way out. Toilet and shower building is new and clean. Grass goes up to lake in the lower campground and a sandy beach is a walk along the lake. Boat launch is available on the lake. Many trails for the kids to explore. 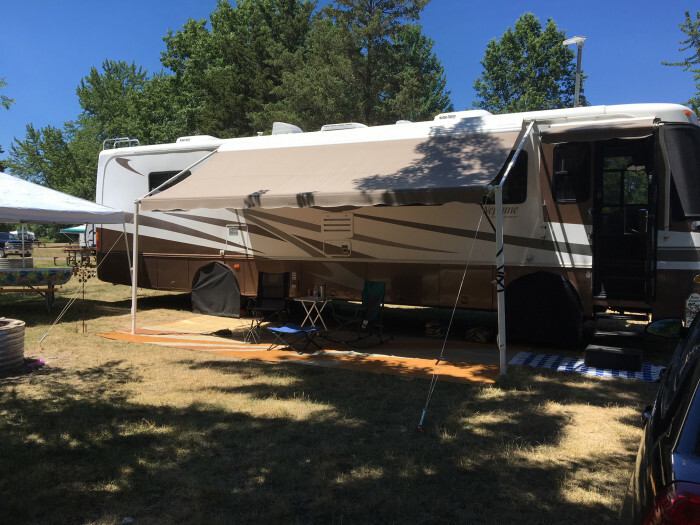 We camped at Bishop Lake Campgrounds at Brighton State Recreation Area in a Fifth Wheel. Are you affiliated with Bishop Lake Campgrounds at Brighton State Recreation Area ?